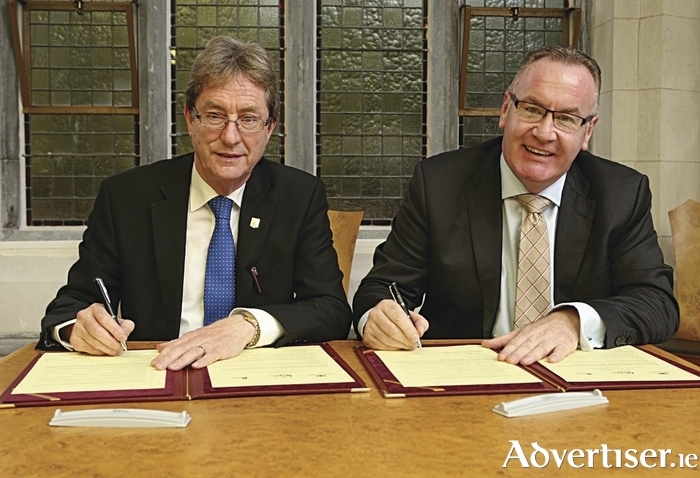 Pictured at he signing of the ‘Poitiers Declaration’ during the Galway City Council meeting at NUI Galway on Monday: (l-r) Dr Jim Browne, President of NUI Galway and The Mayor of the City of Galway, Councillor Pearce Flannery. Galway City Council and NUI Galway have signed an agreement to formalise joint plans for collaboration and development in Galway city. The signing of the “Poitiers Declaration” means NUI Galway is the latest of the Coimbra Group of long-established, multidisciplinary research European universities to agree cooperation initiatives within their local socio-economic environment. Galway joins cities from Barcelona to Vilnius in setting a programme of collaboration in areas as diverse as economic development, public transport and sport. Sharing the benefits and impact of research and education locally, nationally and internationally. Development of policies to attract companies as well as medical, social and cultural services and activities. Internationalisation of the activities of the University and the city. Support for the expansion of youth entrepreneurship directly linked to research. Rethinking of public transport and urban mobility, with attention to the needs of the student population. Promotion of sport among students and all citizens. Speaking at the signing, Mayor of the City of Galway, Councillor Pearce Flannery said this is a unique occasion for Galway City Council to hold its meeting in the Aula Maxima and to sign and endorse the Potiers declaration to enhance collaboration between the University and Galway City Council. The University has made it a strategic priority to serve and engage with its diverse communities through enhanced relationships on campus, in the region and around the world. As a hub for start-ups, and through extensive research collaboration with industry and public bodies, the University places a strong focus on supporting regional economies. Through community engagement and partnerships, particularly in the arts and sport, the University supports social and cultural development as part of a holistic approach to regional development. Speaking at the event, Dr Jim Browne, NUI Galway President said that NUI Galway has a strong tradition of collaboration within our region, and we are delighted to formalise these commitments with Galway City Council.